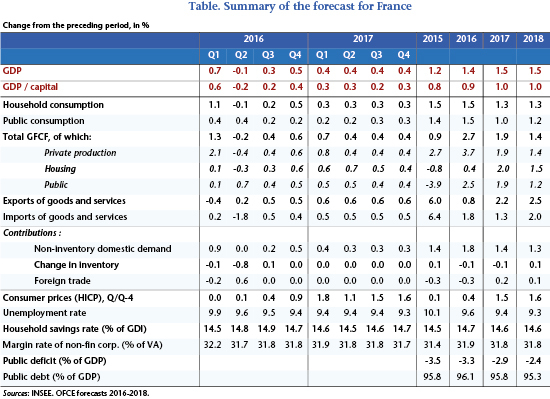 This text summarizes the 2016-2017 forecast for the French economy. Click here to consult the full version, in French. The news on 28 October that French economic growth came to 0.2% in the third quarter of 2016 constitutes a cyclical signal that is consistent with our analysis of the state of France’s economy. This figure is close to our latest forecast (+0.3% forecast for the third quarter) and in line with our growth scenario up to 2018. After three years of sluggish growth (0.5% on average over the period 2012-14), activity picked up moderately in France in 2015 (1.2%), driven by falling oil prices, the depreciation of the euro and a lowered level of fiscal consolidation. For the first time since 2011, the French economy has begun to create jobs in the private sector (98,000 for the year as a whole), which has been encouraged by tax measures that cut labour costs. Combined with an increase in the number of employees in the public sector (+49,000) and the creation of non-salaried jobs (+56,000), the number of unemployed according to the ILO fell in 2015 (-63,000, or -0.2 percentage point of the active population). Meanwhile, boosted by additional tax cuts on industrial equipment, business investment has revived in 2015 (+3.9% yoy). French growth has been below that of the rest of the euro zone since 2014; in addition to the fact that it did better over the period 2008-2013, this is due to two major factors: first, France made greater fiscal adjustments than its European neighbours over the period 2014-16, and second, exports did not contribute much to growth, even though the fiscal approach to supply policy aimed to restore the competitiveness of French business. It seems, however, that since 2015 French exporters have chosen to improve their margins rather than to reduce their export prices, with no impact on their export volumes. While for a number of quarters now this behaviour has resulted in falling market share, this might still turn out to be an asset in the longer term due to strengthening the financial position of the country’s exporters, especially if these margins are reinvested in non-cost competitiveness and lead to upgrading the products manufactured in France. In 2016, despite a strong first quarter (+0.7%) driven by exceptionally strong domestic demand excluding stock (+0.9%), GDP growth will peak at 1.4% on average over the year (see table). The mid-year air pocket, which was marked by strikes, floods, terrorist attacks and the originally scheduled end of the investment tax reduction, partly explains the weak recovery in 2016. As a result of the pick-up in margin rates, the historically low cost of capital and the extension of the investment tax cut, investment should continue to grow in 2016 (+2.7% yoy). The creation of private sector jobs should be relatively dynamic (+149,000), due to support from the CICE competitiveness tax credit, the Responsibility Pact and the prime à l’embauche hiring bonus. In total, taking into account unwaged employees and the workforce in the public sector, 219,000 jobs will be created in 2016. The unemployment rate will fall by 0.5 point over the year, of which 0.1 point is linked to the implementation of the “training 500,000” programme, so at year end will come to 9.4% of the workforce. Meanwhile the public deficit will drop to 3.3% of GDP in 2016, after a level of 3.5% in 2015 and 4% in 2014. In 2017, France’s economy will grow at a 1.5% rate, which will be slightly above its potential rate (1.3%), as the country’s fiscal policy will not hold down GDP for the first time in seven years. On the other hand, in contrast to the forecast last spring, France will have to confront two new shocks: the negative impact of Brexit on foreign trade and the terrorist attacks’ influence on the number of tourists. These two shocks will cut 0.2 percentage point off GDP growth in 2017 (following 0.1 point in 2016). The French economy will create 180,000 jobs, including 145,000 in the private sector, reducing the unemployment rate by “only” 0.1 point, due to the rebound in the labour force as people who benefit from the training programme gradually re-join the workforce. The renewed rise in oil prices and the depreciation of the euro will see inflation rising to 1.5% in 2017 (after 0.4% in 2016). Finally, the government deficit will be 2.9% of GDP in 2017, back below the 3% threshold for the first time in ten years. After stabilizing at 96.1% of GDP in 2015 and 2016, the public debt will fall slightly, down to 95.8% in 2017. The French economy though battered by new shocks and with the wounds from the crisis far from having healed, is recovering gradually, as can be seen by the gradual improvement in economic agents’ financial position: business margins are up, household purchasing power has rebounded, the deficit is down and the public debt has stabilized. François Hollande’s five years in office: Stagnation or recovery? The five-year term of French President Francois Hollande has been marked by serious economic difficulties, but also by some signs of improvement in the last year of his mandate. Overall, France experienced low growth from 2012 to 2014, mainly due to the fiscal consolidation policy, with moderate growth after that (see: OFCE, Policy Brief, no2, September 5th, 2016).